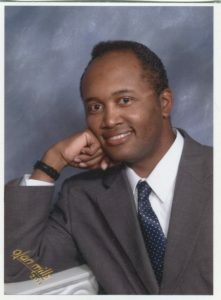 James Blakley was educated at Missouri Western State College and Washburn University. While at MWSC, he was a local and national award-winning columnist and section editor of "The Griffon-News." Blakley worked 10 1/2 years as a page and as an Assistant Librarian for the River Bluffs Regional Libraries of St. Joseph, MO. He currently lives in Topeka,KS where he worked for The Topeka and Shawnee County Public Library and several years in clerical and customer support capacities for international computer companies, such as EDS and HP. Blakley prefers reading history, current events, and allegorical fiction, and runs the gamut cinematically. And besides writing in his spare time, he is an avid pro sports fan who enjoys playing men's fast-pitch softball. It's one of my "gifts." I've always liked reading or hearing a good story. That lead to being inspired to write one myself. And, as mostly a hobby, I've done so since I was at least 9 or 10 years old. Back then, I wrote what I called “paper books”: That is, I’d write and illustrate usually a backyard adventure story using magic markers on ruled paper; then, staple the pages together; and voila…a book was published! I must have penned 50 or 60 from grade school into junior high, with alas maybe 10 preserved. Later, I sharpened and broadened my writing talent, as a high school and college newspaper editor and columnist. Along the way, I won a few local and national student journalist awards. I only returned to fiction writing in 2010, but since then have written 3 novels: "The Steel Deal", "The K-Frost Caper", and "The Diamond Head Deception." All are multicultural mysteries with action, adventure, and even a little romance added, with "The Diamond Head Deception" having won a Finalist for Multicultural Fiction Medal in the 2016 Next Generation Indie Book Awards Competition. I usually write about questions I have or characterizations I'd like to expand upon. For example, my most recent novels, "The Diamond Head Deception" and "The K-Frost Caper", expand the role of insurance investigators, introducing, for example, a cosmopolitan, female Native American (Luna Nightcrow) in the role. While the plot of "K-Frost" is more plausible (solving a complex case of identity fraud),"The Diamond Head Deception" narrative is based upon a question I had: Why doesn't Hawaii have diamonds (since the gems are most often the product of volcanic activity)? For both books, I did lots of real world research that took the form of extensive outlining and character sketching. "K-Frost" introduced the recurring insurance investigator character Luna Nightcrow, and was a bit more literary; while I decided to blur the line between reality and fantasy in "Diamond Head", in order to present a compelling plot. In both, editing the mounds of research I'd amassed was the most involving process. After I'd settled on what to keep, organizing it into a story was easy. Main character development is something that many readers enjoy in a story. In "fleshing out" at least my main characters, they obviously begin to grow and realize the situation they're in and "say", I like/don't like this, or I would/wouldn't do that. Have fun with writing. Think outside the box. Don’t try too hard to write “what’s popular” or “fan fiction.” Also, be prepared for rejection and the possibility that fiction writing, for most, will be a hobby, not a five or six-figure safety net. So ALWAYS have a day job (lol)! As previously stated, I was a published high school and college newspaper journalist. So, I was used to being "published", and taking the praise and criticism that came with it. It was only natural that eventually I'd publish some of my fiction. The problem was that I grew up largely without the e-book, self-publishing revolution. Self-publishing had a different connotation back then, namely inferior. Paperback were king, and it took lots of time and money to produce and distribute them. Often, that meant achieving only local acclaim. So the advent of e-publishing greatly influenced my decision to publish fiction. It's bright, but still not something that many will find financially rewarding. Unless you're willing to follow trends and write what's popular, it's hard building that niche audience or market that will sustain your writing. I write as a relaxing hobby; so the reader is welcome into my world, but often doesn't influence what's in it. That is, I write what I like, how I'd like to see it. That means more diversity of characters and what some might call "offbeat" plots.